These are expertly crafted string quartets of a Haydnesque nature that are utterly charming and relatively carefree musical expressions intended to please a well-polished audience. 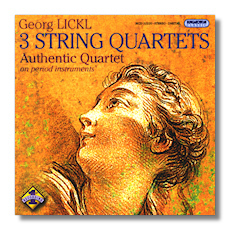 Georg Lickl (1769-1843) had two distinct musical periods during his career. The first period covers his years in Vienna (1786-1806) where secular writing of keyboard, chamber, and stage works dominated his output. The second period begins in 1807 with Lickl assuming the post of choirmaster at the cathedral of Pecs, a position he held until his death in 1843; during this period, nearly all his music was written for church activities. The String Quartets on the Hungaroton disc were composed in the 1790's and reveal a master technician with the faculty to delight listeners with conventional phrasing that always has a keen ear for tuneful declarations. Although not as inventive as Haydn's String Quartets, these works should find grateful recipients among Haydn enthusiasts. The Authentic Quartet plays on period instruments, and its members (Balázs Bozzai, Zsolt Kallo, Gábor Rác, and Csilla Vályi) graduated from the Ferenc Liszt Academy of Music in Budapest. The fault I find with the performances is an antiseptic element as if 'Mr. Clean' was a participant in the production; some blood on the plate would have been advantageous. In my review of the a recent Hyperion disc, I indicate that neither Napravnik nor Blumenfeld were great melodists; that assessment applies equally to Lickl.